Starting in 1989, Namco published a short-lived (only two were made) “Disk Mag” called Disk NG. It’s mostly a bunch of old Namco MSX titles bundled together, but each package contains one game that hadn’t been released on its own. 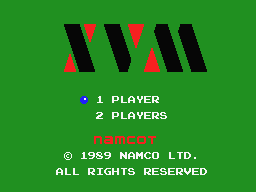 For the first release that was XVM, a Xevious sequel in all but name. 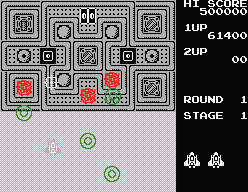 The core mechanics with the Zapper and Blaster are the same, although shooting down ground targets sometimes reveals a power-up, which may change the Zapper for a laser, speed up the player ship or stop time for a short while. 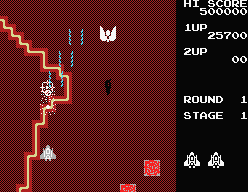 The game is now more formally divided into stages with a boss at the end of each, but after the boss fight the game just keeps scrolling through like Xevious. 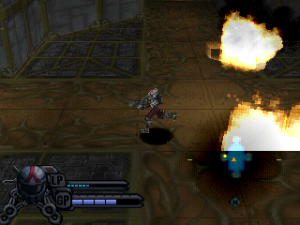 The bosses are all huge installations with countless mounted guns. 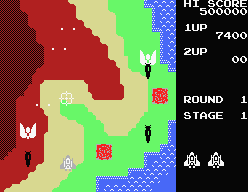 The flying enemies are a bit more out-there than in Xevious and include mosquitoes and turtles.